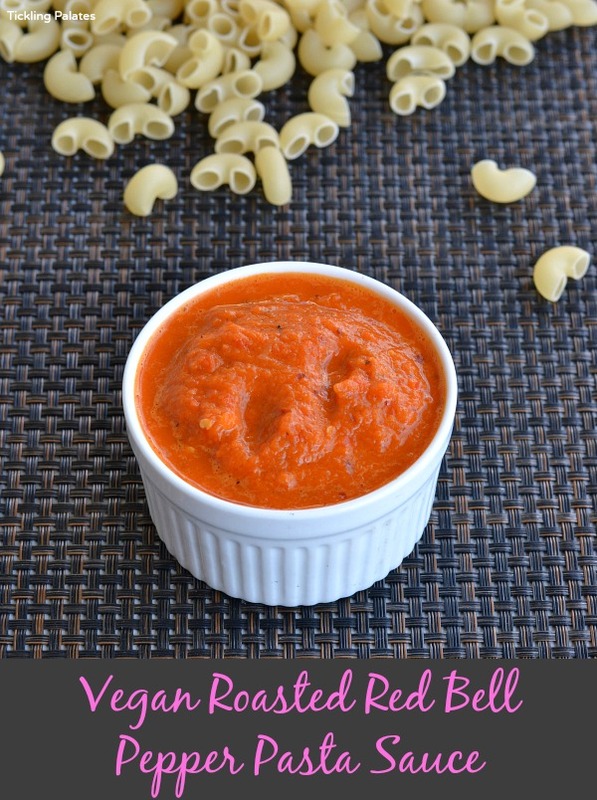 This homemade vegan roasted red bell pepper sauce tasted absolutely yummy when I served it over pasta. This is the first time I’m trying out a pasta sauce with Red Bell Pepper (Red Capsicum) and totally loved it. My kids have always preferred noodles over pasta and have a set mindset that colored peppers are to be eaten only with stir fried rice or noodles. May be that is the reason for my lack of enthusiasm. 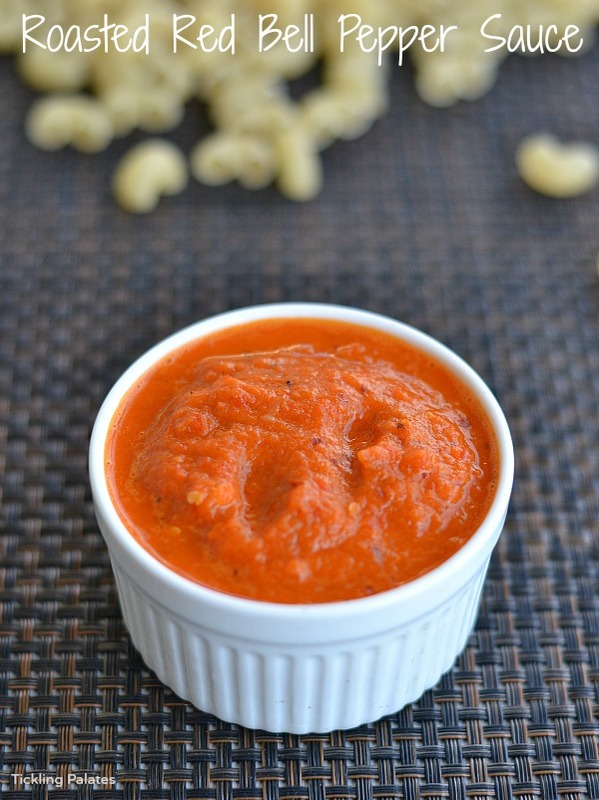 I’m sure there are several ways of making this sauce but here is my version of making this easy sauce at home with simple ingredients that are already available in your pantry. 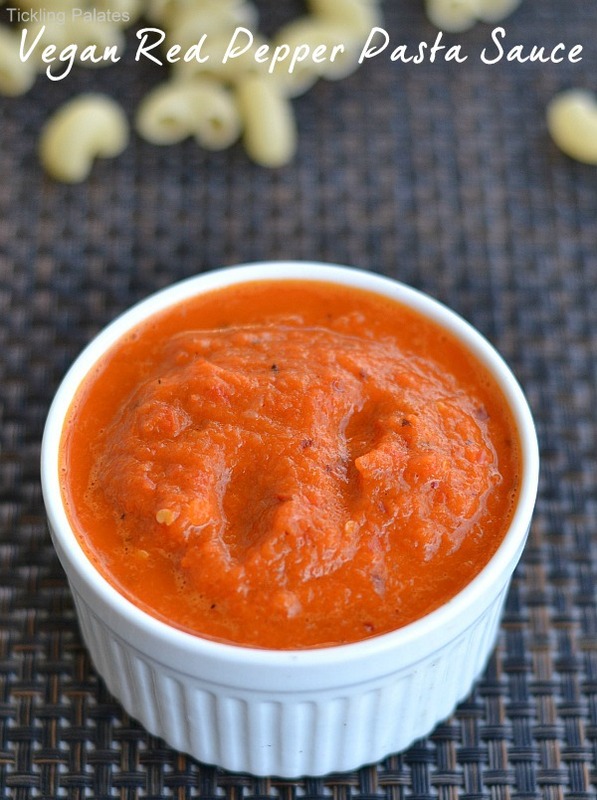 This is a very flexible sauce and you can serve it mixed with pasta, Couscous and you can also use it to spread on pizzas and breads to make a sandwich. These are just a few ideas on how you can use up the sauce, but I’m sure if you are really adventurous, you can use it several other ways apart from what I have mentioned. Heat a pan with 3 tsp oil. Add whole dry chilies and sauté for a few seconds. Add the chopped onion, garlic pods, tomato, red bell pepper and sauté till the veggies get roasted well and shrink in size. Take off fire and let it cool completely. Transfer the mixture to a mixer jar or food processor and grind to a smooth paste using 2 to 3 tsp water. Heat the same pan with remaining 1 tsp oil. Add the ground paste, mixed dry herbs, salt and mix well. Cook for 1 minute over medium flame till the sauce thickens. Take off fire. You can either use the sauce immediately or let it cool completely and transfer to a jar before refrigerating. Use the refrigerated sauce within a day or two. Tomato is used to give the sauce a tangy taste and to increase volume. So you can totally skip it if you do not have at hand. 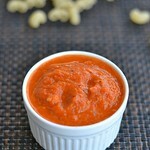 Instead of tomato, you can also use 1/2 cup of sour yogurt to get the tangy taste but then the sauce will not be vegan. If you do not have mixed dry herbs, use a handful of fresh coriander leaves or cilantro and sauté it along with the vegetables before grinding. Instead of using whole dry red chilies, you can also use ground red chili.